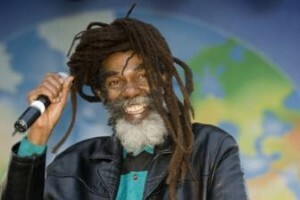 Don Carlos is a classic reggae act with his consistent band, his horn section and his strong catalog of songs. His live show is in great demand worldwide. Don spent six years as the lead vocalist for Black Uhuru from 1989 to 1994, during which he toured and put out four albums with Black Uhuru — Now, Mystical Truths, Iron Storm and Strong. Now back with his solo career, Don's shows consistently pull strong numbers in North America, South America, Europe and Africa. His CD's also continue to sell strong number s, while with the CD market down 85 percent, most of the other artists these days don't sell many units. Don's schedule of live shows is very busy. He recently returned from a September / October European tour, where he was again well received. Before that he was touring North America as a special guest with Slightly Stupid. Prior to that in June 2011 he did some western U.S. dates on his own including the Reggae in the Desert festival, in Los Vegas and also a big double bill show with Junior Reid at 4th and B in San Diego. Last winter Don performed on the Southern CA Raggamuffin shows in Long Beach and San Diego. That was a tribute to Don, since normally they don't repeat acts, and Don was on the shows the year before as well. A lot of the festivals host Don Carlos year after year. Last March, Don toured South America. March, 2010 Don toured Europe, and in April and May 2010 he toured South America and Africa. His show at the Kasarani Sports Grounds in Nairobi Kenya Sunday May 30th 2010 made history, drawing the second biggest crowd ever for a reggae show since the Bob Marley performance at the Zimbabwe Independence ceremony – 110,000 people. In his music, Don speaks for all people. He sings about peace and love, generosity and righteousness. He doesn't leave out thanking Jah for everything. "I love you and Jah loves you more", he says. "Love Jah, and you will have everything — all wisdom." Don has a big heart and a kind loving spirit. He is a special artist. Because of his blessings, the multitudes are drawn to him. Don Carlos (born Euvin Spencer) Legendary Reggae Artist was born and raised in one of the most deprived regions of Western Kingston, Jamaica, in a district notoriously known as Waterhouse, which incidentally is also a musical spawning ground for many of Reggae's greatest ever talents, such as King Tubby, Black Uhuru, The Jays, Junior Reid and King Jammy, to name but a few. Don Carlos started his singing career in 1973 as one of the original members of Black Uhuru, alongside other founding members, Garth Dennis who later went on to joining the Wailing Souls, and Derrick Ducky Simpson. As part of the trio, Don sang lead on the highly acclaimed Love Crisis album, for producer Prince Jammy in 1977. This album was later re-released and re-titled as Black Sounds of Freedom. A year after the trio's groundbreaking debut, Don Carlos surprisingly decided to leave Black Uhuru in pursuit of a solo career. Within three years as a solo artist, developing his song writing and grooming his distinctive vocal style, in May 1981 Suffering was released. This strong release took the fraternity by storm, courtesy of a heavy roots and culture flavored showcase for the Negus Roots label. This album was a massive hit in Africa, selling unprecedented units. Unfortunately, the album was bootlegged, and Don never received proper royalties. At this time, he worked alongside Goldie, his sidekick, co writer, and back up vocalist. Together they built a staunch following through touring the live circuit and releasing consistant albums including Harvest Time, Day to Day Living, Them Never Know A Natty Dread Have Credentials, all three issued in 1982, Spread Out 1982 also otherwise known as Laser Beam to which the majority of tracks in this set have been culled, Never Run Away 1984, Just a Passing Glance 1985 and more recently Seven Days a Week. Don's partner, Gold was tragically shot and crippled, putting him out of the music business. During the eighties dance hall mania, Don had five top ten hits between 1982 — 1985- Late Night Blues, Nice Time Tonight, Dice Cup, Hog & Goat, I'm Not Getting Crazy and Spread Out. Don is still churning out solid, melodic roots reggae. Other titles in his rich catalogue include Roots and Culture, Raving Tonight, Pure Gold, Spread Out, Plantation, Never Run Away, Slow Down Vol. 3, Rasta Brothers, Prophecy, Firehouse Clash, Deeply Concerned, Ease Up, Lazer Beam, Ras Portraits, Grove w/me, Head to Head, Jah Light, Live in San Francisco (2002), and Special Edition. There's an old saying in the music industry that claims: What goes around, comes back around. In Dons' case, a request for reinstatement to his former role as lead vocalist for a rejuvenated Black Uhuru reunion resulted in another strong Black Uhuru album — Now. 1990 marked the reunion of the original vocal trio with Don, Garth and Duckie. After six years- 1989-1994- and four albums, singing lead for Black Uhuru in the studio, and on the road, Don again went back to his solo career. His other titles with Black Uhuru include Mystical Truths, Iron Storm and Strong. All of these four albums are classics with Don up front on lead vocals.